In the business world, communication between the seller or any representative from the industry and the prospective client is very important for a successful business transaction. Whatever type of business it may be, negotiations are important because it educates the client with the products or services that they are about to avail, and it also helps the seller in gaining the trust from their prospects. Through successful negotiations follow closed deals, which is a win-win situation for both sides of the party. But how can a business person initiate negotiations in the first place? 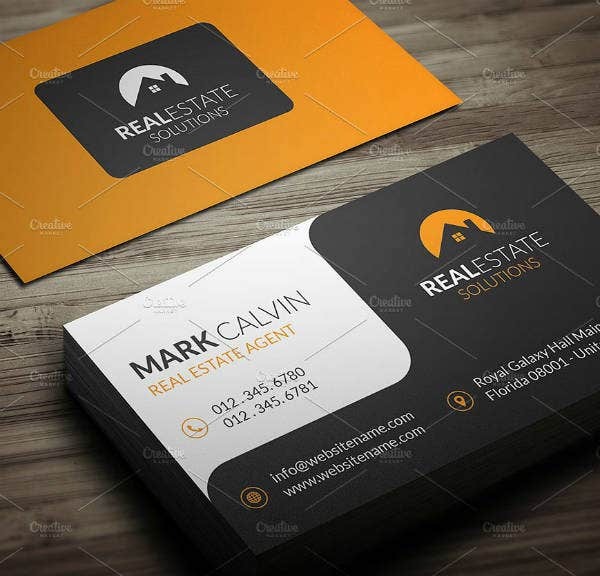 By introducing themselves and the type of business that they are managing to their prospects while handing them a copy of their business cards. By prospect, we actually mean that in two ways: prospective clients and prospective business partners. There may be cases wherein one industry will make a proposal to work hand in hand with another, making them business partners. For this to be possible, both of these businesses will need to exchange contact details which can be done by exchanging simple business cards. In the same manner, business people will need to share their contact details to prospective clients in the order form them to be easily contacted if the prospect decides to get in touch with them either to ask inquiries or to make a purchase. Enough with those explanations. 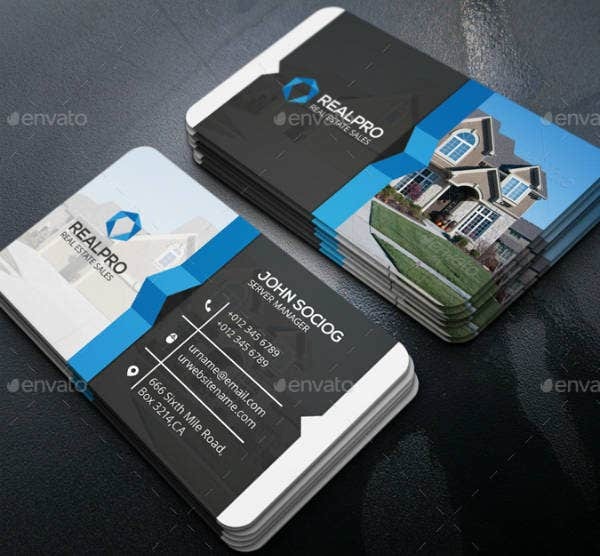 Let’s get to the main point of this article, which is business card samples specifically for real estate professionals. 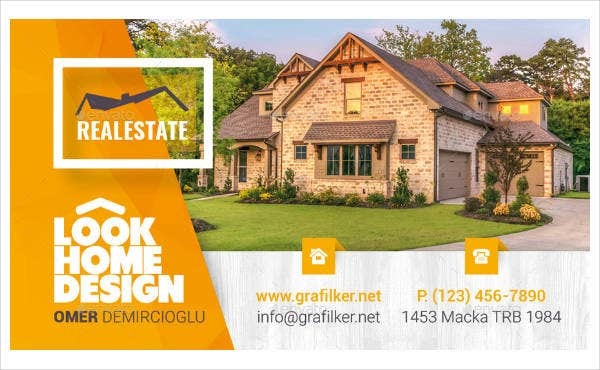 If you are working in the real estate industry either independently or under an agency, then you might probably be interested in what we have to offer for you in this article. 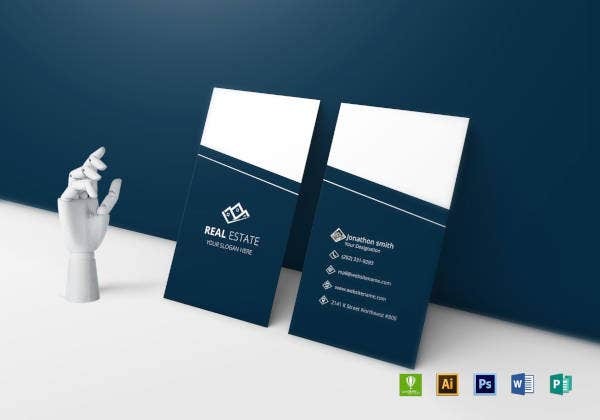 Below is a collection of real estate business card templates that you can download, edit, and print, and we have gathered these high-quality templates from multiple websites so that you won’t have to. If you’re ready, scroll down to see the templates yourself. 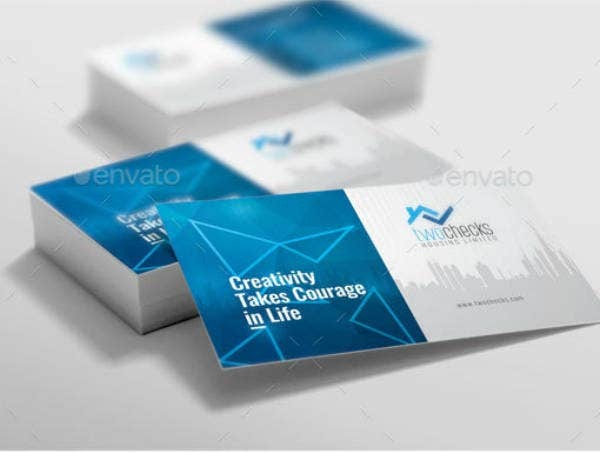 Let’s start off with this modern-looking business card template which contains geometric graphical elements over the photo background to add enhancements to the entire design. 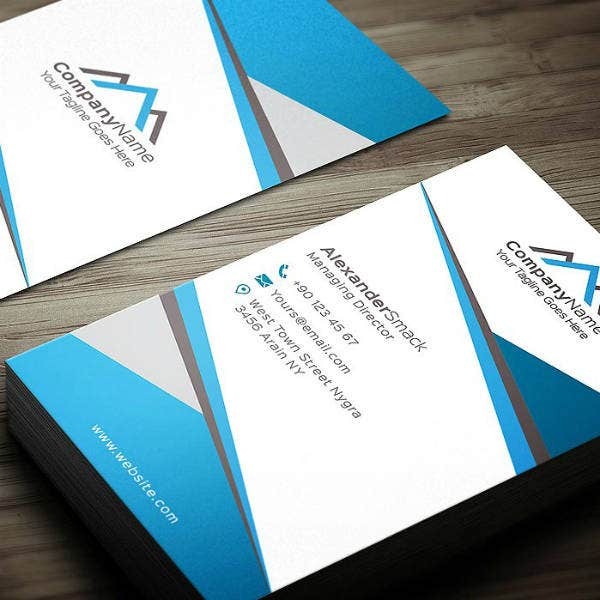 While the design on both sides of the card is relatively similar, the content is different. 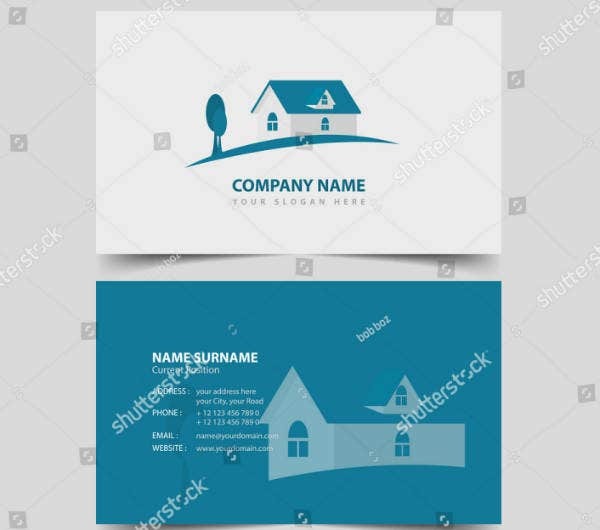 The front side of the card simply contains the name and the logo of the business, while the back side of the card design is where the contact details are indicated. 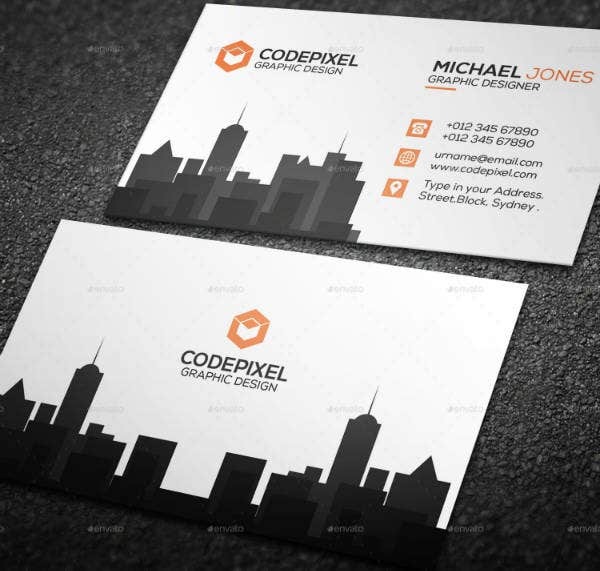 This would be a great template to use for those who prefer a modern yet simplistic design on their business cards. 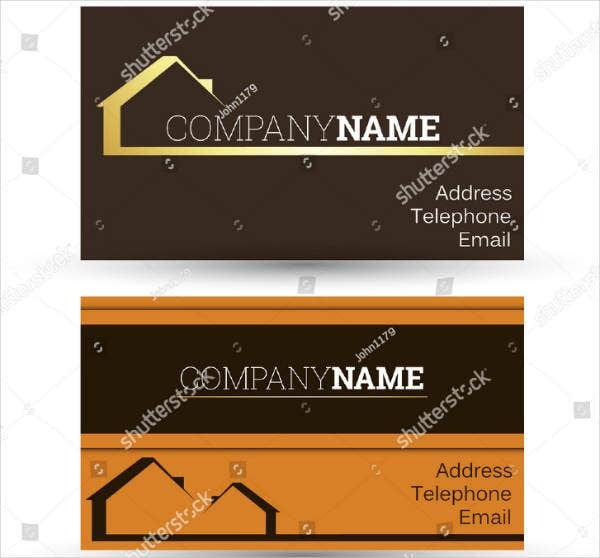 For an even simpler design on your business card, you might want to use the flat-themed, minimalist business card template above. This template makes use of flat or solid-colored elements for the entirety of the design, with some textual elements written over it. 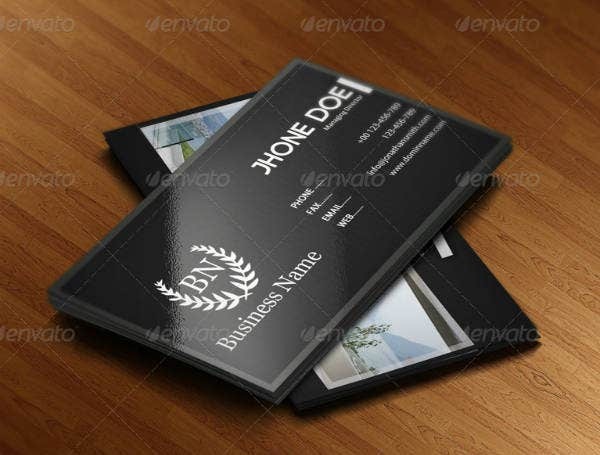 For this template, the most of its elements are placed on one side of the card only, and this includes the name of the cardholder and their contact details. 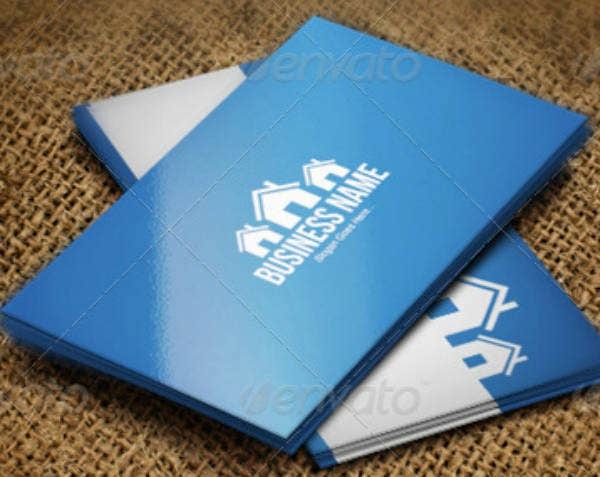 The only element featured on the back is the business’ logo placed over a solid-colored background. Indeed, “Creativity Takes Courage in Life”, and this statement can also be applied by real estate professionals when sales talking or when designing marketing tools. Opening and managing a business will require you to take risks, and to stand out from the competition, you will also need to be creative with your marketing campaigns. 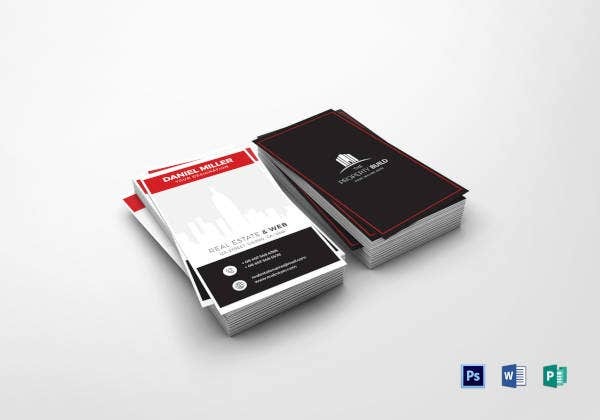 These are just some of the factors that will need to be considered when running a business, but if you believe that you have what it takes, then feel free to download and use the functional and creative business card template above. 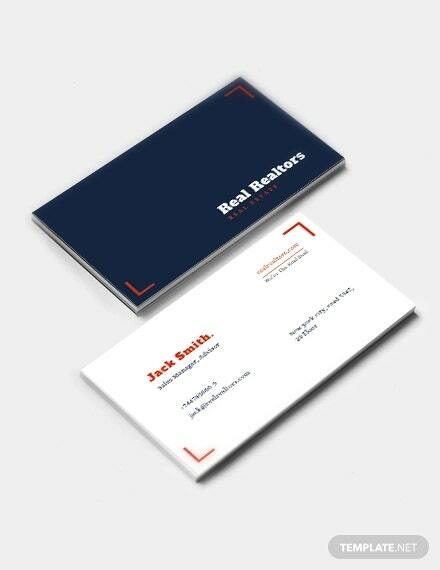 Why Are Business Cards Important in the Real Estate Profession? Being in the real estate needs a lot of reaching out to people, advertising, and convincing sale talks, which may sound like an easy thing to do, but it actually takes a lot of going the extra mile. We already know that when doing sales talking, you don’t just explain to prospects what you are trying to sell, but you actually need to dig deeper when providing prospects with more than enough convincing reasons as to why they should avail of your products. But before you can start doing those sales talks, you will need to make yourself known, of course. 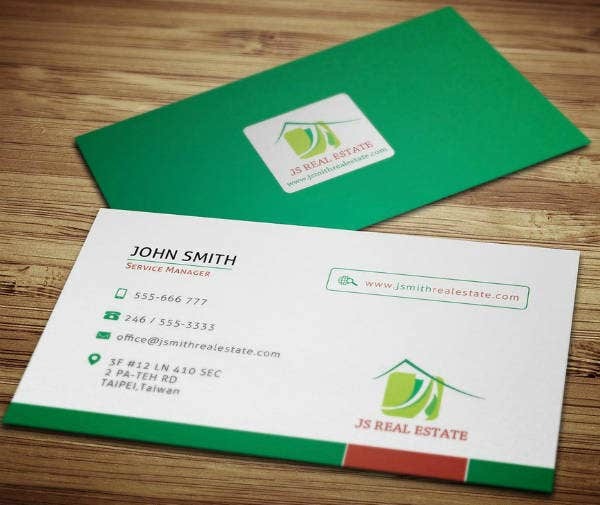 Before trying to sell real estate properties, it is very important that people should know in the first place that you are a real estate professional, and you are able to do this by introducing yourself as one and giving them a copy of your business card. With real estate, you can not always expect clients to avail of those properties right there and then, negotiations will take place to the extent that the client may request to see the property personally before actually making up their mind. This is highly understandable especially if the client chooses a long-term stay in that property, and purchasing properties itself is rather costly. The client will need to decide carefully whether the property that they are considering is indeed worth investing, especially in the long run. 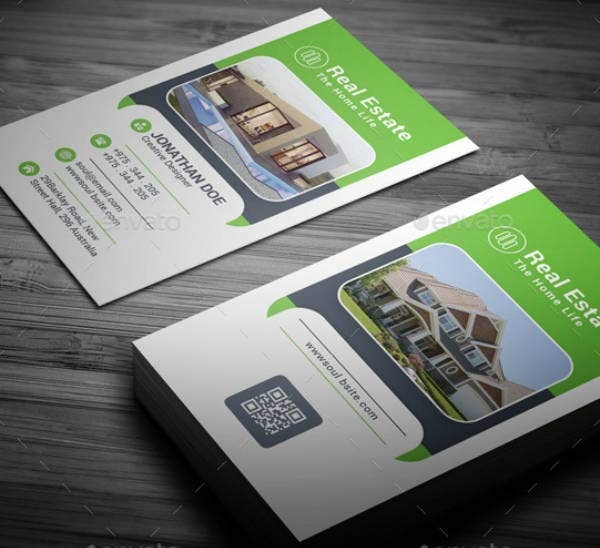 This is absolutely the reason why it is important for real estate professionals to provide their prospects with a personal business card, so they can always keep in touch with them with regards to their decision. 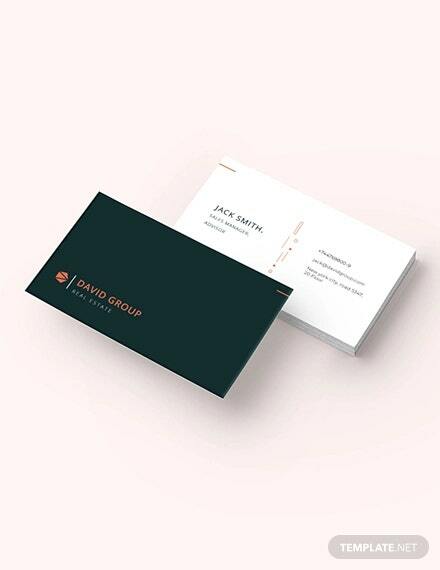 If bright color schemes aren’t really your thing, then you’ll probably be interested in using the sleek business card template shown above. 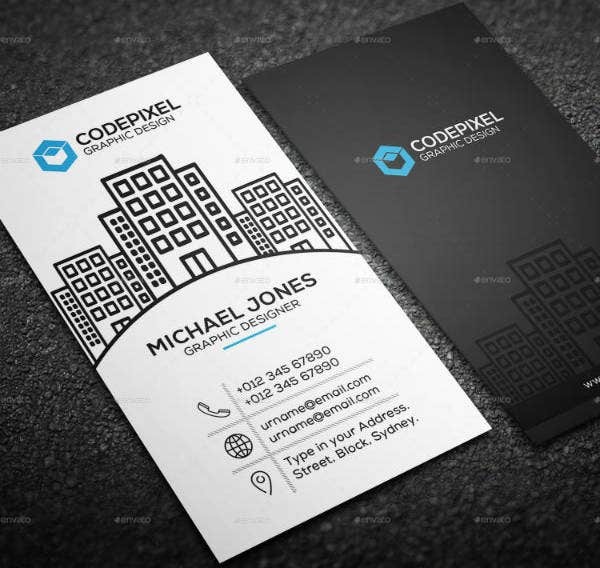 Other than that, this template may also be perfect for those who prefer their business cards to have a simplistic yet functional look. 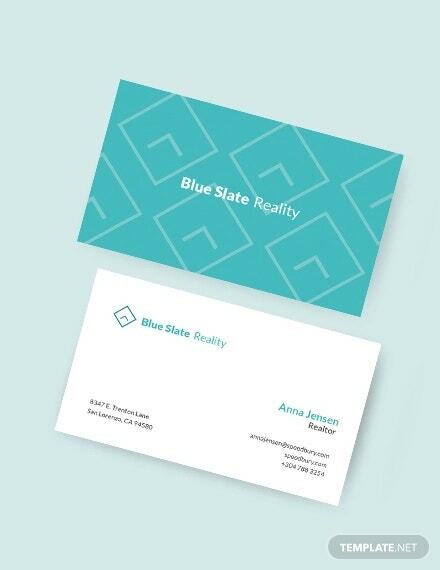 The great thing about using a dark color scheme—especially when having it printed with a glossy finish—is that it doesn’t entirely get affected by glare, and this actually helps in making the business card highly legible even in extreme lights. 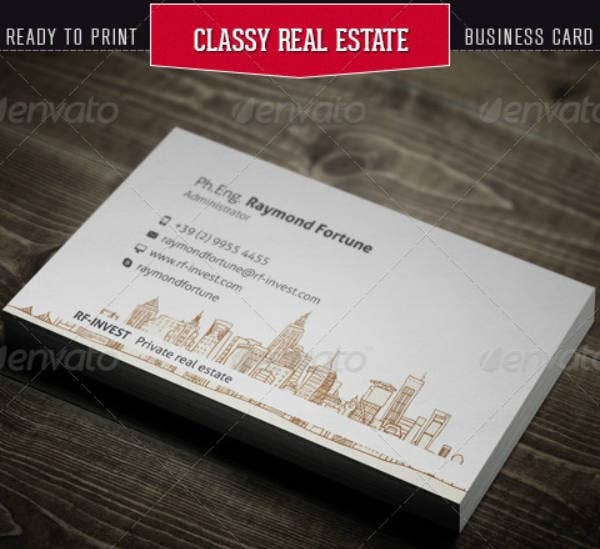 As much as you want your business card to look creative, it is also very important that your business cards be functional in the sense that they are able to convey the needed business details effectively to the prospects. 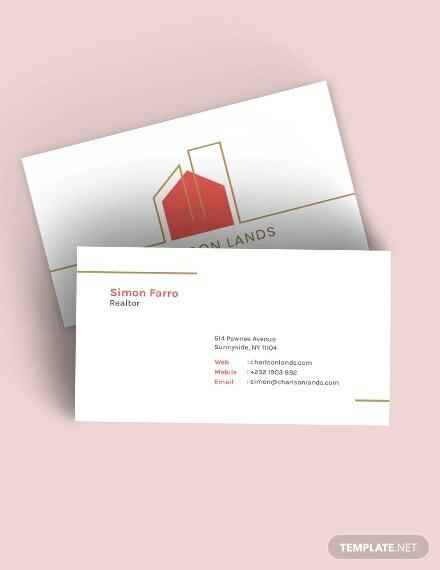 With the agency business card template above, the use of graphical elements are kept at a minimum and the design leans more towards highlighting the contact details of the cardholder. 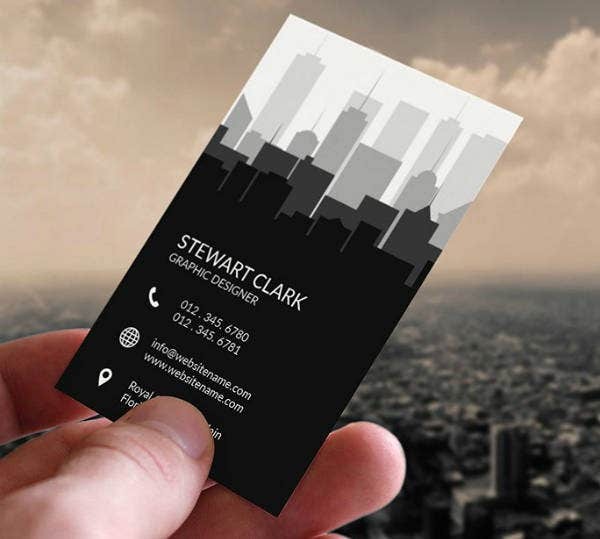 Another way that you can make your business card simple but still creative is by taking advantage of its negative space. If you don’t know what negative space is, it is actually the use of a particular element’s colored area for drawing an illustration using white or any color that contrasts with that on the element. It is quite similar to silhouette illustrations, but with an inverted color scheme. 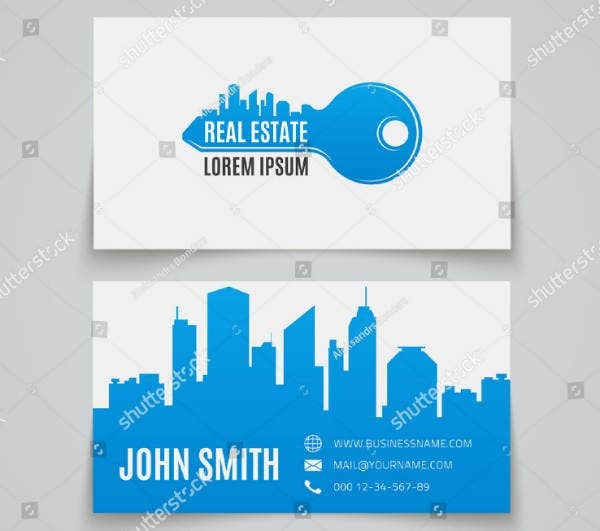 Take for example the sample design above, which shows a blue colored layer with an illustration of houses and text drawn and written in white. 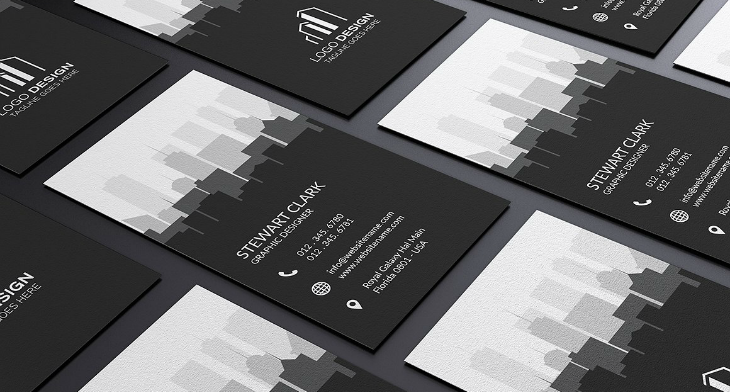 If this is the style that you want, then you might want to download this clean business card template. For those who are working independently, they can always choose to make a logo for themselves or they can also use a monogram as their logo. 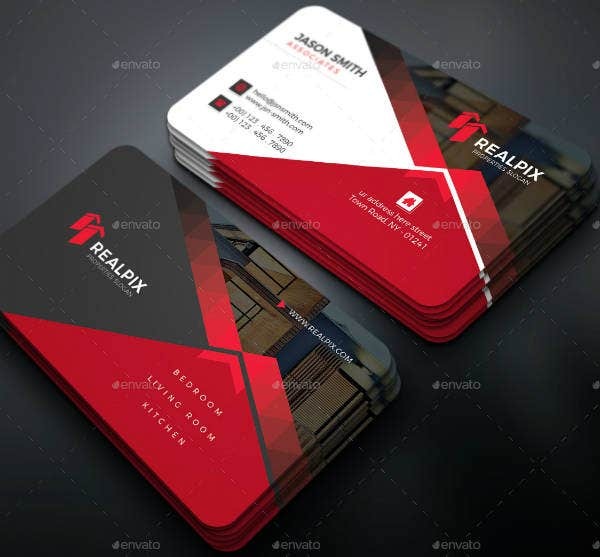 But for real estate professionals working under an agency, including a logo with the business name would be appropriate since it helps in creating the identity of the card holder. You may want to place the these elements either on one side of the card, or you can also place it on both. Probably one of the most important features that should be included on a business card since it bears the identity of the cardholder. This section provides the prospect with the name of the person who they will get in touch with and their respective title or their designation in the company. In this case, the title of the cardholder may either a real estate agent, broker, or associate. Another feature on business cards that should never be left out since this is the reason why business card designs exist in the first place. 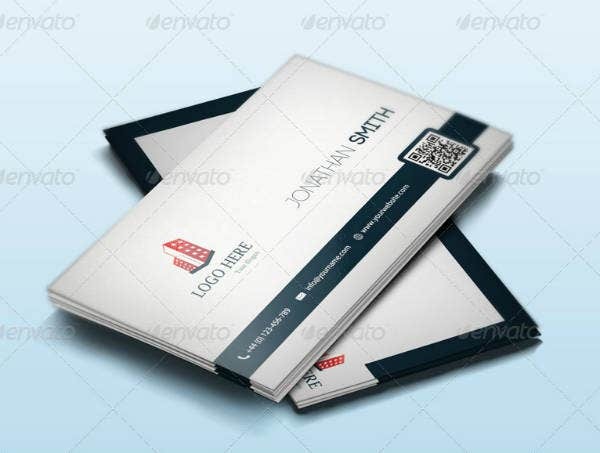 The reason why business cards are used is to exchange contact details between business people or to share a business person’s contact details with their prospects. In terms of contact details, you can actually put more than just your phone number, you can also include your fax number and email address/es. Though highly recommended, the inclusion of a URL is not entirely necessary. You may want to include a URL for your personal or agency’s website, or you may rather include one for a social media page, though there are also others who choose include both. Otherwise known as QR codes, these make navigating to your webpage or social media page a lot easier since instead of having to memorize and type the entire URL, you can simply scan the code using a smartphone. But you can also program QR codes to do other things aside from just redirecting prospects to your webpage, you may also have it redirect prospects to a video streaming website with a video orientation of your business, or it may also show them a map of your office.